I love looking at old fashioned photos don’t you? Its fascinating to see what life was like way back and see how we have advanced – some for the good and some the not so good. Before the 1860s, foul waste would be dumped into ditches, which would then flow into the rivers. London began to suffer from recurring epidemics of cholera. In 1853 – 1854 more than 10,000 Londoners were killed by the disease. It was thought at the time to be caused by foul air. The hot summer of 1858 created the ‘Great Stink of London’, which overwhelmed all those who went near the Thames – including the occupants of Parliament. This, together with the frequent occurrence of cholera, gave impetus to legislation enabling the metropolitan board to begin work on sewers and street improvements. By 1866 most of London was connected to a sewer network devised by Bazalgette. He saw to it that the flow of foul water from old sewers and underground rivers was intercepted, and diverted along new, low-level sewers, built behind embankments on the riverfront and taken to new treatment works. We still use these amazing sewerage systems now, they have provided a clear divide between humans and their waste. Drainage Engineers or “Flushers” as they were nicknamed would provide the necessary maintenance in the new sewerage systems across the country, coping with blockages in their weird and wonderful get-up!. With very limited equipment and certainly no protection these men probably had the worst job ever dealing with the blockages of our cities – the work was dangerous! 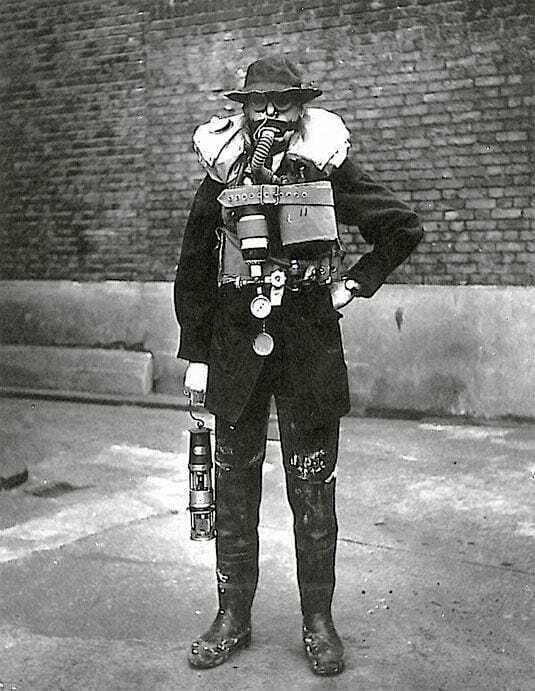 This gentleman was one of the old fashioned London “Flushers” aka Drainage Engineers equipped with breathing equipment and a lamp. 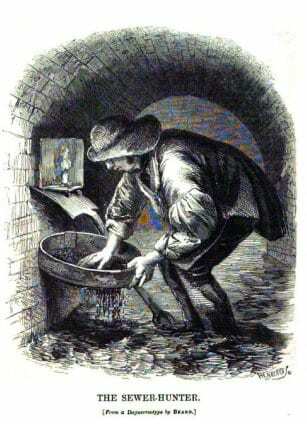 Below is a 1850’s “Tosher” or Sewer Hunter searching for items of value amongst all the waste! 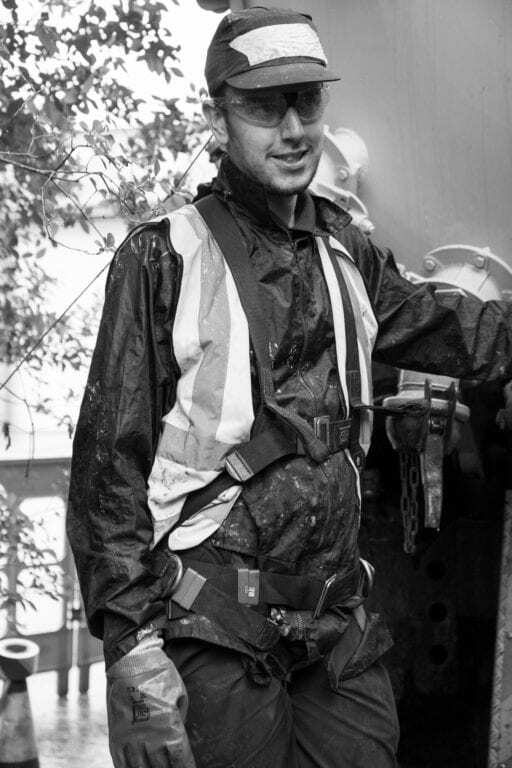 A modern-day Metro Rod Drainage Engineer. Fully equipped to unblock drains and sewers with slightly different equipment! Metro Rod is aware of its obligations under legal statutes and recognises that to be a successful company it needs to place health preservation and the safety of its employees, contractors, franchisees, clients, public and others at the forefront of its operational thinking and planning. Health and Safety is very important to us at Metro Rod , we are aware of our legal obligations and recognise that to be a successful company, health and safety is paramount. We have invested a lot of money into providing our engineers with the best equipment. Our clients and the public are guaranteed peace of mind that all of our work is carried out to the highest standards. Health preservation and safety for our employees and contractors is placed at the forefront of our operational thinking and planning. For more information about this see Health and Safety section on our website. We therefore provide all of our engineers with ; Gloves, Overalls, High-Vis jackets, hard hat, goggles, visor, ear defenders, steel toe cap boots, gaunlets, safety torches, safety harnesses. Our Engineers are also fully accredited with CSCS Cards, DBS Checked and will hold be trained in High Pressure Water Jetting, Confined Space, Street Works, Working at Height Training, Utility Avoidance, Forecourt Training, Power Access and Asbestos Awareness to name a few. 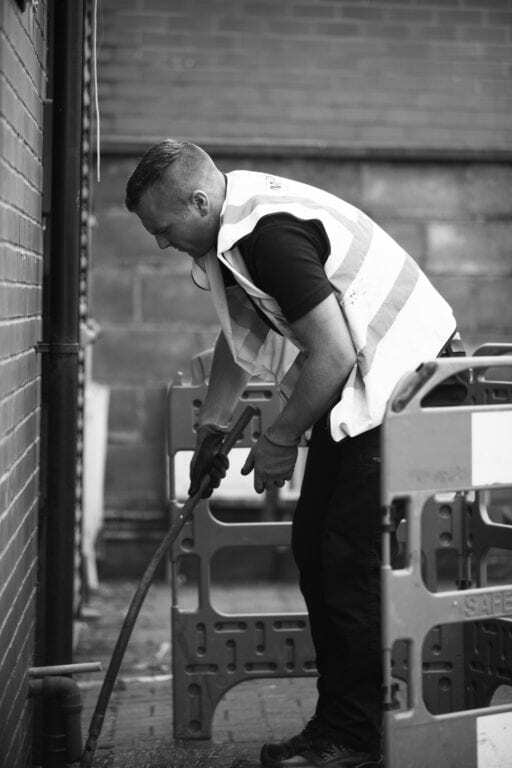 Our engineers are able to assist our clients with all manner of drain maintenance, including blockages, septic tank disposal, CCTV Drainage Surveys, pipe lining and rehabilitation, grease trap management, pre planned maintenance, gutter clearance. We operate a 24/7/365 emergency service for blockages, working around the clock to provide you with a quick, effective and efficient service for all of your drainage requirements in Cambridge, Kings Lynn, Thetford, Downham Market, Brandon, Newmarket, Red Lodge, Ely, Saffron Walden, Royston, Hunstanton, Snettisham, Bury St Edmunds and all the villages in between!